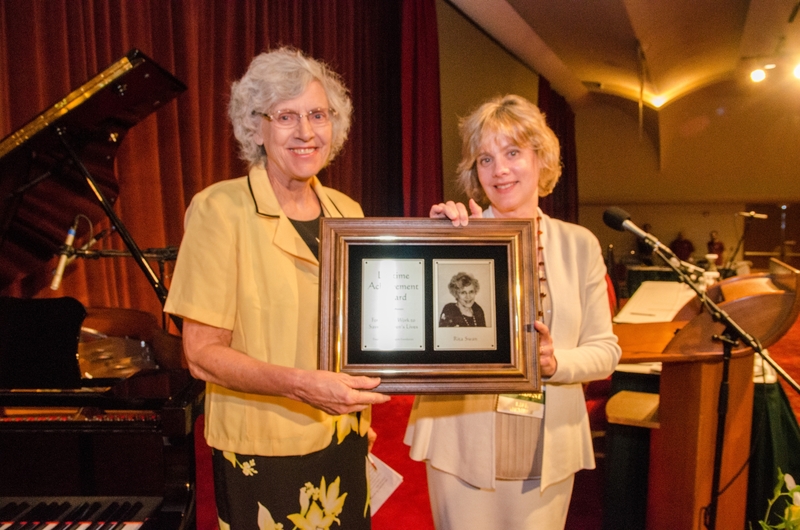 CHILD President receives award from FFRF Co-President Annie Laurie Gaylor. Children’s Healthcare Is a Legal Duty (CHILD), Inc.
is no longer an active tax-exempt charity. There is, however, a new successor non-profit organization called Children’s Healthcare Is a Legal Duty USA (or CHILD USA) operating out of the University of Pennsylvania. It was formed with the original CHILD’s encouragement and support and is dedicated to ending child abuse and neglect through evidence-based research resulting in enlightened law and public policy. We encourage you to visit the CHILD USA webpage. This original CHILD website, www.childrenshealthcare.org, continues however as an archive for CHILD’s many endeavors from 1983 to 2017 to protect children from harmful religious and cultural practices—especially faith-based medical neglect—through public education, research, legal action, and a limited amount of lobbying. A second webpage, IdahoChildren.org , will also continue to be available online. It is our intention and hope that they will be valuable resources for those current and future advocates working for the healthcare of all children to be a legal duty. We are deeply grateful to those who supported our child advocacy work during the past 34 years.